One of the biggest challenges being faced by companies in the current era is nurturing social media accounts. Not all companies have a capable team to manage the company’s social media accounts. 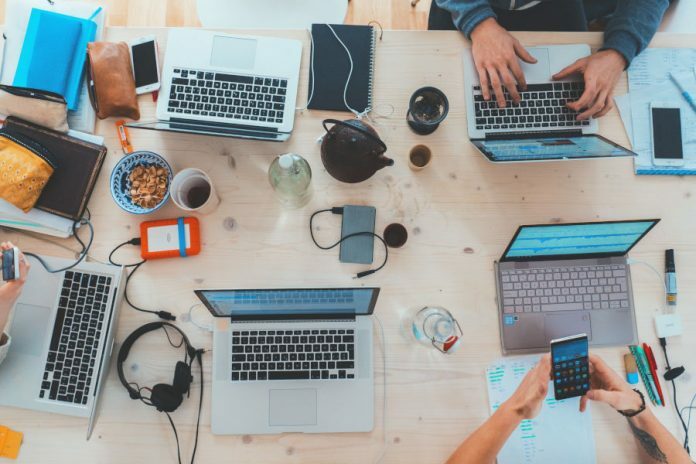 Instead of creating an internal social media team, some companies prefer to entrust a social media agency to help them manage their social media accounts. Nurturing social media for business is completely different from nurturing social media for personal use. You need to know the best times to post new content to the social accounts you are handling. And more importantly, you have to analyze the performance of your social media accounts. You have to analyze which posts perform better and which posts less effective. If you really want to maximize your social media accounts to grow your business then you need an appropriate tool. SocialPilot is one of the tools you can use. SocialPilot is a social media tool which you can use to schedule social media posts. It allows you to add several accounts at once. You can then post the same content to different social media accounts from different platforms on a single click. This way, you don’t need to login to every single of the social media account you are handling only for a single post, which can be time-consuming. SocialPilot is a comprehensive social media tool. Other than scheduling social media posts, it also features analytics which you can use to gauge the performance of the social media contents you have posted. SocialPilot supports all of current popular social media platforms. Including Facebook, Twitter, Instagram, LinkedIn to Pinterest, whereas the number of social media accounts you can add depends on the plan you subscribed to. The cheapest plan — called Professional — allows you to add up to 50 social media accounts. Following are social media platforms that are supported by SocialPilot. Note: While SocialPilot cannot post to Instagram directly due to API issues, it helps you schedule Instagram posts with reminders and notifications in its app. 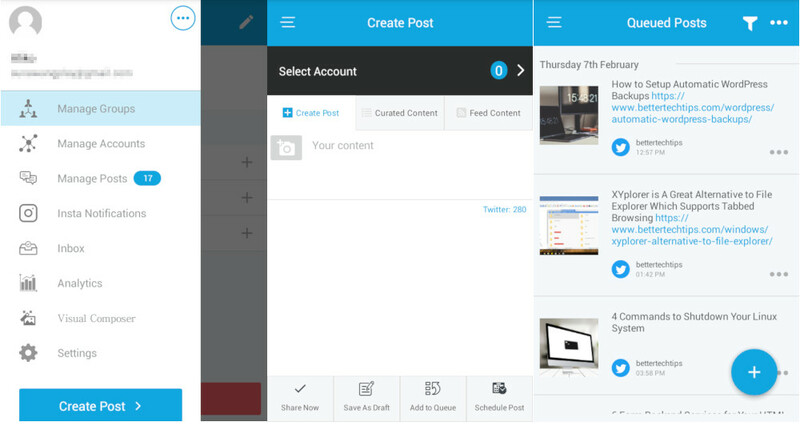 SocialPilot allows you to post up to 500 contents each day. Scheduling contents on SocialPilot is extremely straightforward. You can do by clicking the Post menu in the left panel or by clicking the Add Post button on the top bar. When adding new content, you can add image, video or GIF. SocialPilot is integrated with Dropbox and Giphy to allow you to search for images and animated GIFs. The connected social media accounts lie on the right side of the screen. You can simply tick the social media accounts you want to schedule the contents for. If you want to post content immediately instead of schedule it, you can also do so. There are four options offered by SocialPilot: Share Now, Share Next, Schedule Post and Repeat Post. One of the interesting features offered by SocialPilot regarding content publishing is its content calendar. This feature allows you to easily check all of the contents you have scheduled. You can also reschedule posts by dragging and dropping them. More interestingly, you can also manage (delete and edit) the contents right from the calendar. You can click one of the scheduled contents to do so. To access the calendar feature, you can click the Posts menu on the left panel. SocialPilot also supports bulk scheduling. You can import a CSV file to schedule several posts at once. Maximizing social media campaign is a complex job. Your job is not limited to scheduling posts, but also analyze which posts are perform better and which ones are not. SocialPilot comes with analytics features which you can use to gauge the performance of the contents you have posted. The analytics feature of SocialPilot is available for four platforms: Facebook, Twitter, LinkedIn, and Pinterest. You can find the Analytics menu on the left panel on the SocialPilot dashboard. The stats displayed by SocialPilot analytics are different depending on the social media platform. For instance, for Twitter, the analytics will display stats of the likes and retweets earned by the tweeted contents. You can easily figure out which tweets earned most likes/retweets and which tweets earned fewer likes/retweets. The SocialPilot analytics for Twitter also shows the top 5 influencer users. You will have more detailed stats for Facebook. You can see stats like demography, popular posts, most active likers, popular hashtags and so on. The analytics feature of SocialPilot is helpful enough to gauge the performance of the published contents. Especially for agencies, you can also download the analytics into PDF as a report for your clients. If you have too many social media accounts to handle, you can invite your team members to help you in preparing the contents. The number of team members you can invite differs depending on which plan you subscribe to. The cheapest plan — Professional — allows you to add up to 5 members. There are two roles offered by SocialPilot: manager and content scheduler. One social media account can be handled by more than one team members. Content schedulers can only schedule posts and the posts should be approved by the manager before added to the queue. You can invite your team members by email. In addition to team members, you can also invite your clients. However, clients won’t be able to schedule any content. They only have one job: to connect their social media accounts. This concept is great because your clients don’t have to share their password with you. This way, you can convince your clients that you won’t ruin their social media accounts. SocialPilot is a web-based social media tool. However, it also provides supporting apps to make it easy for you to add contents to the scheduling queue. This tool offers browser extension for Google Chrome, Firefox, and Safari. The browser extension of SocialPilot allows you to add the web page you are visiting directly to the scheduling queue or post it right away without having to login to the dashboard. SocialPilot also has apps for Android and iOS so you can manage your social media accounts on-the-go. The SocialPilot app for Android and iOS is much like the web version in which you can manage the posts, manage groups and schedule new posts. You can also access the analytics features via this app. Please note that not all features of SocialPilot are available on all plans. For instance, the client management feature is not available on the Professional plan because this feature is aimed at agencies. SocialPilot is a social media tool that you can use to manage contents for your social media accounts. You can use it to schedule social media posts and monitor the performance of the posted contents to figure out which posts are performing better and which ones are not. This tool comes with an analytics feature to allow you doing so. SocialPilot is particularly a great tool for social media agencies since it comes with a client management feature. This feature allows you to post new contents to the social media accounts of your clients without having to login to the concerned social media accounts. There are 8 social media platforms supported by SocialPilot: Facebook, Twitter, LinkedIn, Pinterest, Instagram, Tumblr, Xing, Google My Business, and VK. SocialPilot itself is a web-based tool so you can use to no matter the operating system you use. There are also apps for Android and iOS which brings the SocialPilot dashboard to your mobile device, while the browser extension allows you to instantly add a web page to the scheduling queue. SocialPilot is pretty easy to use, it has an intuitive content composer and useful calendar to visualize your content strategy.